March is over! I’m pretty sure it lasted approximately 1,000 years but it was also over in like 2 seconds. Not sure how to explain that; I don’t have all the answers, guys. Anyways, I read some books! Not nearly as many as I thought I would or wanted to, but hey, it happens. I actually kicked off the month really strongly by reading 3 books that were all quite good 4-star reads, and I was fooled into thinking that the rest of March would be stellar reading as well. It wasn’t! I started reading (but didn’t finish before the month was over) House of Leaves by Mark Z. Danielewski, and it sucked up a ton of my reading time and also (spoiler alert) I hated it, so it wasn’t even really worth it. While trudging through House of Leaves, I did read a few other books, but honestly, nothing really blew my mind this month and now I’m desperate for another 5-star read. Desperate! And in non-reading-but-still bookish news, I got to see Colson Whitehead give a talk at a local college, and he was amazing and funny and I bought The Underground Railroad and he signed it. So that was pretty awesome. And! And! At a separate bookish talk at a different local college, I got to see my hero/idol Margaret Atwood give a talk, and she was just the coolest. And here are some reviews! Purple Hibiscus by Chimamanda Ngozi Adichie (4 stars) – This book was beautifully written, but very difficult to read due to the subject matter. It’s about a wealthy family in Nigeria whose extremely religious father severely abuses both his children and his wife while presenting himself as a good and charitable man to the community. When the children are able to go visit their aunt and cousins and get away from their father for a week, they are awakened to the fact that life shouldn’t be like this. An Unkindness of Magicians by Kat Howard (4 stars) – The Magicians meets Gossip Girl meets Game of Thrones. This book is about a tournament between prominent magical Houses in New York to gain the rule of the Unseen World, or the world of magic. Our heroine, Sydney, is a badass magician with a traumatic past out for revenge. I enjoyed the heck out of this book and would recommend as an enjoyable modern fantasy with great worldbuilding. I could definitely see this as a TV series and wish the book had actually been a series as well. I did have some issues with the writing style, which isn’t perfect, and the fact that climactic action sequences typically only lasted about a page was an odd choice. But overall, I really liked this book. 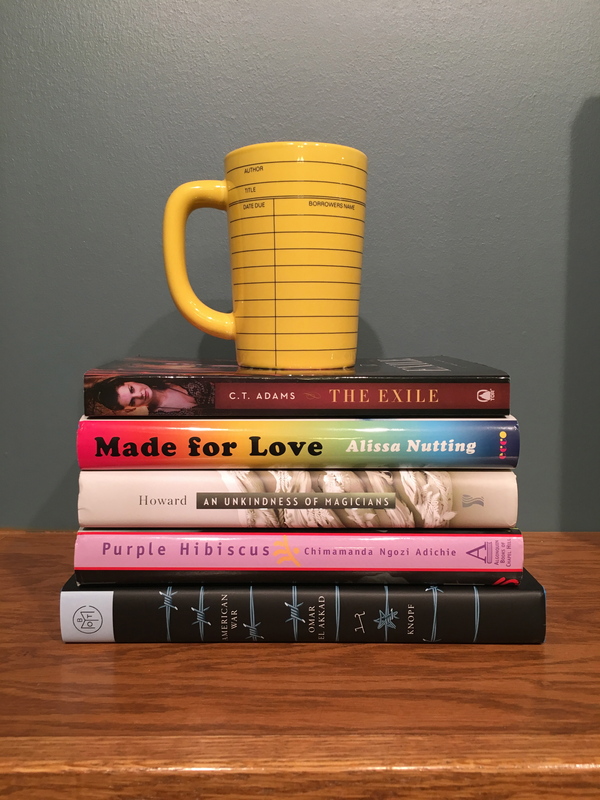 Made for Love by Alissa Nutting (4 stars) – this was very weird and quirky and full of incisive humor about human nature and behavior. Some people may hate it, and I didn’t love the ending, but overall I thought the writing was great and I very much enjoyed the read. American War by Omar El Akkad (4 stars) – another difficult read, because this deals heavily with war and its many horrific incarnations and aftereffects. It’s hard to say I “enjoyed” this one, because it was so difficult to read in some parts, but I thought that the worldbuilding was really interesting and this future a very terrifying one. A Promise of Fire by Amanda Bouchet (3 stars) – So, I really enjoyed the writing style, heroine, and Greek mythology-inspired worldbuilding of this book, but I was not a fan of the “alpha” male main character and the fact that he kidnaps the heroine and we’re all just supposed to get over it. I am going to continue with this series, but it definitely has its issues. Bachelor Nation by Amy Kaufman (3 stars) – A very quick, entertaining analysis of the Bachelor/Bachelorette franchise written by a fan who never shies away from the problematic aspects of the show. Kaufman moves from the history of reality dating shows to an analysis of how contestants are treated and why they act the way we see them on-screen to the modern implications of reality TV fame for contestants. If you watch the show UNreal, there’s nothing too shocking, but I did enjoy it, as you probably will too if you’re looking for a lighthearted, fun read. The Exile by C. T. Adams (3 stars) – Great premise and ideas, but I wished everything had been fleshed out a LOT more. We could have used more of an introduction to the characters and the world, and the third-person narration with multiple POVs only served to distance me from characters I really wanted to get to know better, and could have done so through a sole main character (Brianna)’s eyes. I really just don’t think that having multiple POVs added anything to the story at all and I’m not sure why that was done. I liked Adams’s version of Faerie quite a bit, however. 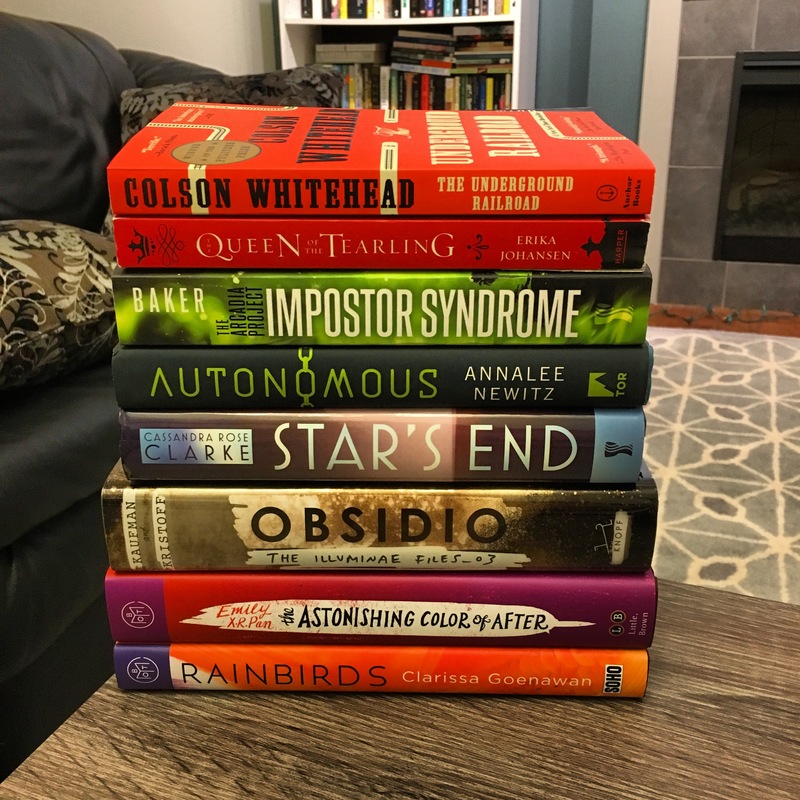 February started off with a bang and 2 five-star reads, which was awesome and unexpected! Both of these were nonfiction reads, and I read them right at the same time, which was also very unusual for me; unfortunately, after that, I did have a bunch of mediocre, middling-type reads that were only OK, before I wrapped up the month with a few better reads. Nasty Women: Feminism, Resistance, and Revolution in Trump’s America, edited by Samhita Mukhopadhyay and Kate Harding (5 stars) – YES. This is the type of nonfiction that makes me love nonfiction. This collection was powerful and full of diverse voices discussing the 2016 election, its aftermath, and how we can resist the coming issues. 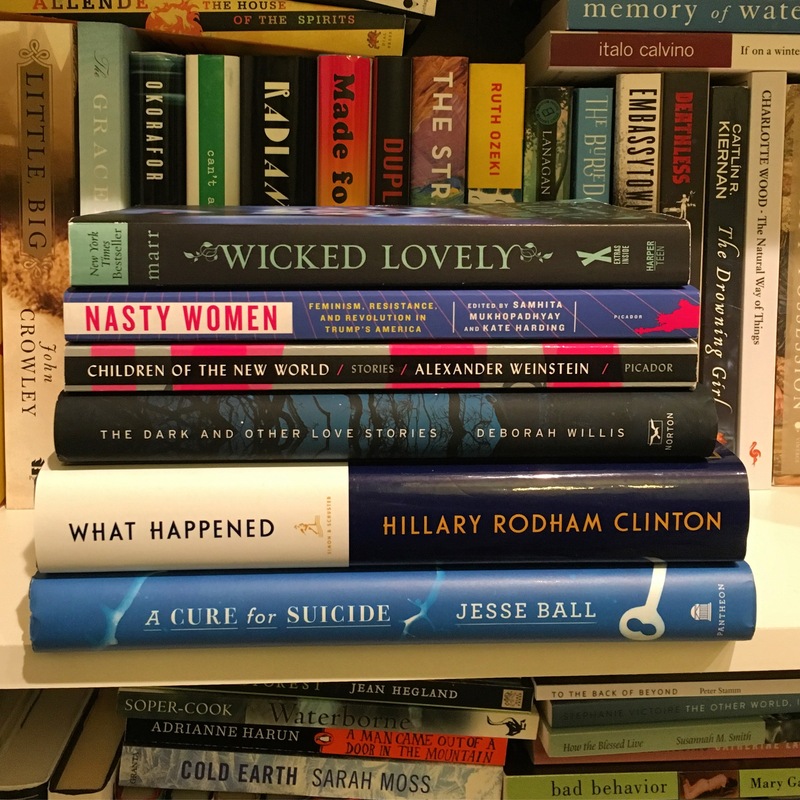 What Happened by Hillary Rodham Clinton (5 stars) – This book does a very thorough job of exploring what happened during the 2016 election. It’s also a collection of Hillary’s meditations on various issues and topics and a discussion of her life and background. I found it extremely powerful and teared up at several points, particularly the ending. I wish so much that she could have been our president. A Cure for Suicide by Jesse Ball (4 stars) – a weird, short, dialogue-heavy novel with sparse prose and a strange premise. A man, referred to only as the “claimant,” wakes up with no memories and must be re-taught even the most basic parts of life by a woman referred to as the “examiner.” I enjoyed the oddness and the slow reveals about what’s going on. Children of the New World by Alexander Weinstein (3.5 stars) – I’m picky about short story collections and the prose in this one was nothing to write home about; I also felt like all of the main characters were basically the same middle-aged dude. However, the science fiction concepts were really interesting and the different tech advances and their impacts on humans very well thought-out. Creative, but I wasn’t blown away. The Dark and Other Love Stories by Deborah Willis (3 stars) – So, unfortunately this one ended up being a bit of a disappointment for me. It’s not a bad book by any means, but I think that the title being “The Dark and Other Love Stories” makes you think that you’re getting, well, dark love stories. And I wouldn’t classify these stories as dark so much as sad. They left me feeling sad and kind of disappointed, for the most part. I wasn’t that impressed by the writing and I was hoping for deeper meanings that just weren’t there. To be fair, the short stories I read are mainly magical realism, whereas this collection is realistic fiction, so the style isn’t what I’m used to. I will say that I really loved the story “Girlfriend on Mars,” which for me was by far the strongest story of the bunch. Most of the others just didn’t nearly measure up. The Perfect Stranger by Megan Miranda (3 stars) – Unfortunately, this one was a disappointment for me. I greatly preferred Megan Miranda’s other adult thriller, All the Missing Girls. I still enjoyed her writing style in this book, but the plot twists for me were just not very good; things weren’t explored and also didn’t make a ton of sense. Wicked Lovely by Melissa Marr (3 stars) – this is the first book in a YA UF/PNR series that I found at a library book sale for $1 and thought I would give a try. 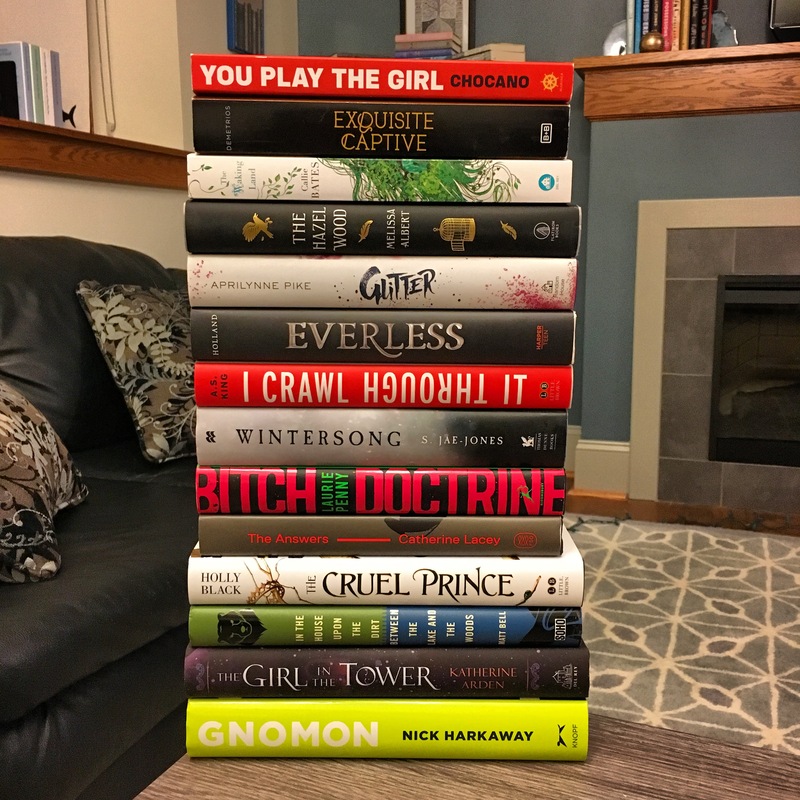 (It also fits into Fae-bruary, a readathon to read fae-related books in the month of Feb, which I hadn’t planned on participating in, but was just a nice coincidence) And I enjoyed it, but I wouldn’t say it was amazing. The writing is pretty good, and I liked that the Fae in this world are very cruel, which is my preferred version of Fae, but the book definitely had a lot of issues. There are 5 books in this series and I do think that I will try to read them all based on this one, but I’m not necessarily expecting anything earth-shattering, and this isn’t a new favorite series or anything. Ink Exchange by Melissa Marr (3 stars) – this was the second book in the Wicked Lovely series, and unfortunately it had a lot of the same issues of the first book. It also got a lot darker in tone, and I did enjoy it, but I opted not to continue with the series afterwards. My Lady Jane by Cynthia Hand, Brodi Ashton, and Jodi Meadows (3 stars) – Meh. I used to read a ton of historical fiction about the Tudor period, so it was interesting to see an alternate take on familiar historical figures, and I did like the twist about prejudice against animal shapeshifters replacing the religious conflicts of the era. Overall, however, this just kept getting too silly for me and it lacked any depth.